Corporate lifestyle = many hours in seated position, this causes many muscles to shorten/stiffen up, causing postural problems and often pain. Stretching is an easy method of self care that you can do to assist in relieving muscle shortening and discomfort. Previously in this blog I have shown stretches for the upper body and how to safely execute them. This stretch is focused further down the body, we are looking at the hip flexors. These muscles are located deep, attaching to the spine, pelvis and thigh bones. Often when they are tight they can send an achey pain into the lower back and or thigh. If you have any joint conditions or major concerns get a doctors clearance to confirm that you are safe to proceed with these stretches. All stretching should be done slowly, deliberately into and out of the stretch, holding the stretch for at least 10 seconds. *Please avoid these stretches if you have had a hip, back or knee injury, seek professional exercise advice if unsure. This stretch is performed in a lunge position. The target hip will be the side that has the leg down the other side will be holding most of your weight and shifting your body weight until a desired stretch is achieved. To assist you can allow one knee to touch the ground or you can hover it off the ground (starting position-picture on the left). Use a stable support for balance such as a wall. Inhale, on the exhale while gently lunging further forward, bending the front leg, ensure to maintain a straight spine/natural curves. Do not push forward in the low back, this may lead to injury, avoid doing the stretch if you can not achieve the stretch without arching/pushing your back forward. Focus on breathing while stretching. Gently push back out of the stretch and repeat 3-5 times. Repeat the whole process on the other side. The demonstration supplied is an example however if you have greater flexibility your back leg may be quite a bit further back, avoid bending the front knee more than 90deg, to reduce stressors on the knee. If you have less flexibility you may find that you can not start with your target leg knee straight down and you may feel a stretch before the the hip is straight. There is a degree of difficulty in this stretch, always ensure that you are only working to your capabilities and if in doubt obtain a medical clearance before you proceed. This blog does not intend to replace any exercise specialist advice if so required we suggest that you seek professional assistance. Massage can be another effective treatment for tight hip flexors and may offer relief. These muscles have a powerful effect on our posture, to have them released can make a big difference to and individuals posture. Stretching is a wonderful easy way to manage your own discomfort and feel great. people who look after everyone else and forget about themself. In conjunction with the chest stretches this stretch is wonderful to help relieve pain or discomfort between the shoulder blades. *Please avoid these stretches if you have had a shoulder injury, particularly affecting stability, such as but not limited to dislocations, muscles strains, ligament sprains, or seek professional exercise advice if unsure. It’s also important to remember to be gentle moving into and out of stretches to avoid injuring yourself. These stretches are a guide and by no means replace your personal professional advice if required. *Ensure you keep your head up. If you find it difficult to feel the stretch, you may use a fixed pole to link your hands around and pull back gently to feel the stretch. Ensure you keep your feet in a wide stance to support your body weight and control the resistance level of the stretch. *Please avoid these stretches if you have had a shoulder injury, seek professional exercise advice if unsure. I will be posting more stretches and tips to living well. If you would like to know more please feel free to contact me on the number listed or Click here. This is a wonderful easy way to manage your own discomfort and feel great. Do you want to put that special touch on your next event? Body and Mindset Wellness have provided that “Special Touch” at a range of Corporate events, Yours can be next! 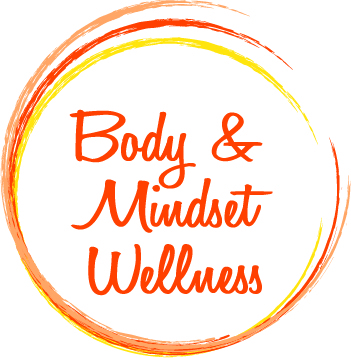 To discuss how Body and Mindset Wellness can assist you at your next event please Click here or feel free to call us on 1300 796 940. It may be an in-house event such as: workplace OH&S days, Training days, Fundraisers, Ladies days, or off-site such as Marathons, Sports days and Expos. Offering Corporate massage can take your event to the next level for those attending. At Expos the use of Corporate massage sparks interest to the particular stall, attracting more attendees at the expo to visit your business stall and look at what you have to offer. Corporate massage can be seated or table massage, it is perfect to imprint a fantastic impression, on the participants, of your business. 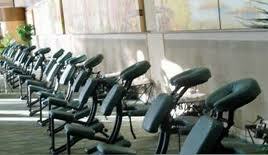 Table massage is great for Corporate Sports days, seated massage is ideal for Expo’s, Ladies days and OH&S days. Corporate massage at Sporting events and Marathons is a wonderful way to assist in the recovery for your team or the event participants. When is your next Corporate Event? Todays stretches are for the forearms. Long hours sitting at a computer can cause these muscles to get very tight leading to wrist, hand and elbow problems or pain. It is a great idea for anyone who spends time using a computer to implement stretches regularly, rather than suffering from the discomfort of the overuse injury that often can occur. *Please avoid these stretches if you have had a injury, particularly shoulder, wrist or elbow, such as but not limited to dislocations, muscles strains, ligament sprains, or seek professional exercise advice if unsure. It’s also important to remember to be gentle moving into and out of stretches to avoid injuring yourself. These stretches are a guide and by no means replace your personal professional advice if required. Sit up right, feet flat on the floor. 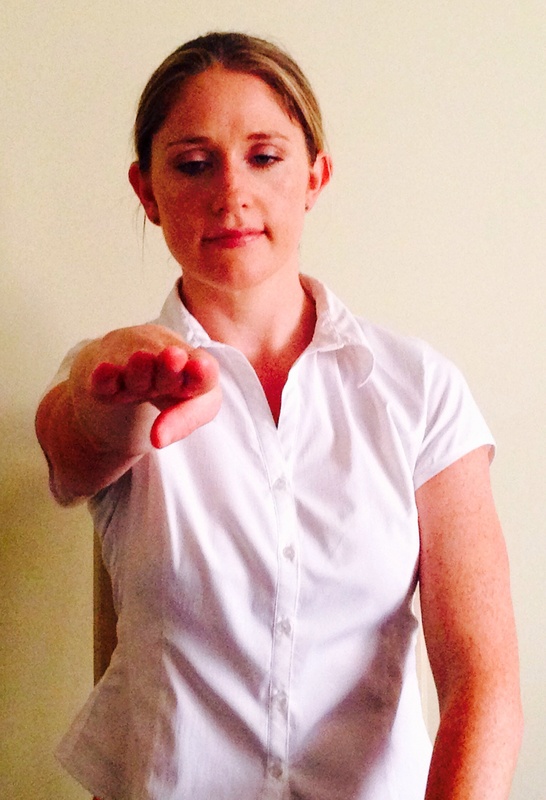 Place your arm to be stretched, out in front, with a bent elbow and palm forward (see picture). The 2nd hand grasps the stretching arm’s hand, including fingers and thumb. Keep the shoulders down, avoid lifting them to get into the position or moving into the stretch. 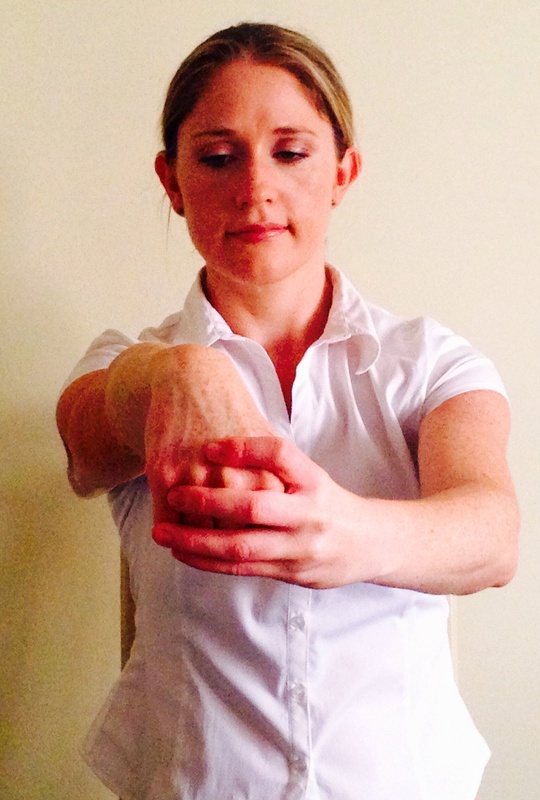 Gently pulling back on the fingers while straightening the arm to feel a nice comfortable stretch. You may find simply straightening the arm gives all the stretch you need, with out pulling the back much on the fingers. 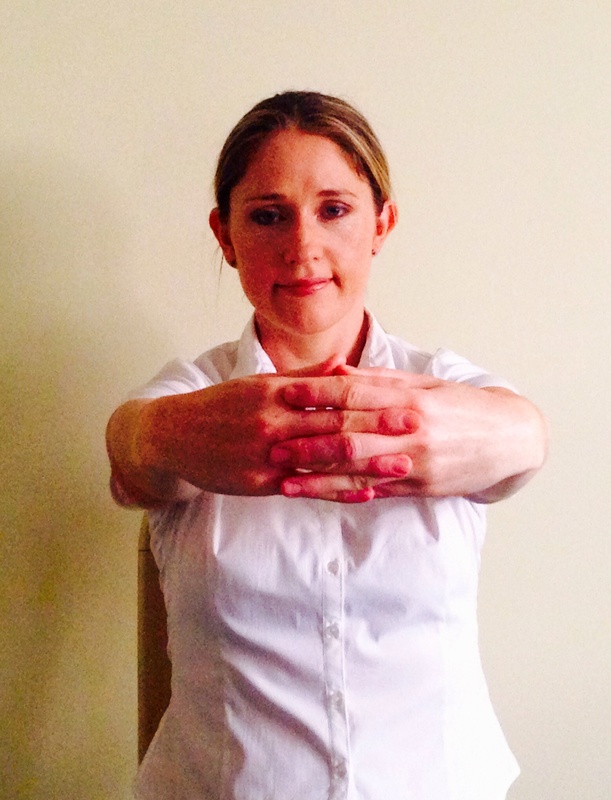 Hold the stretch position for at least 10 seconds and repeat on the 2nd arm. * People will have the varied ranges of movement, please do not attempt to get your hand beyond a comfortable stretch, the photos are to guide you only. 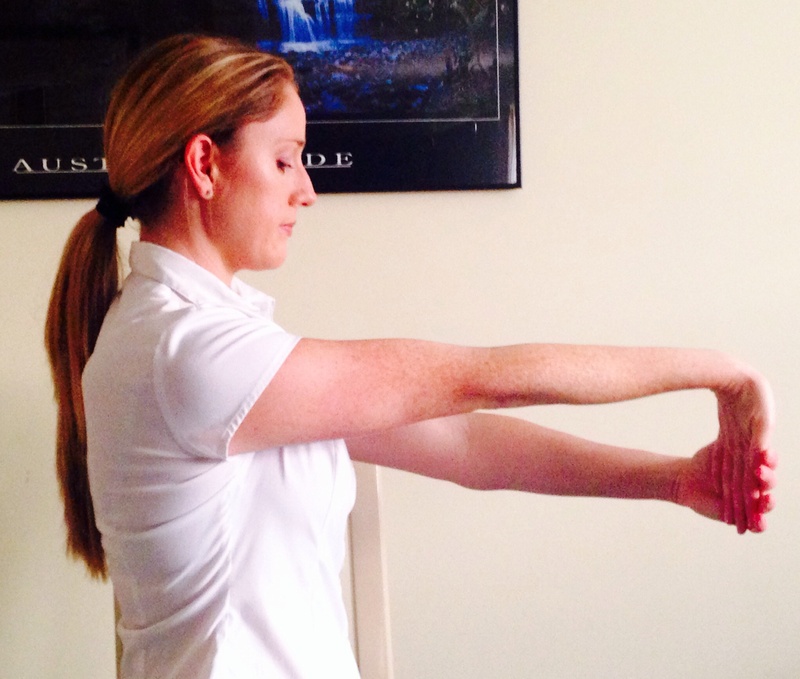 The other side of the forearms are our extensor muscles, below is how to stretch them. Tuck your thumb in and curl your fingers around to make a fist . The 2nd hand grasps the stretching arm’s hand, securing fingers and thumb in the fist. 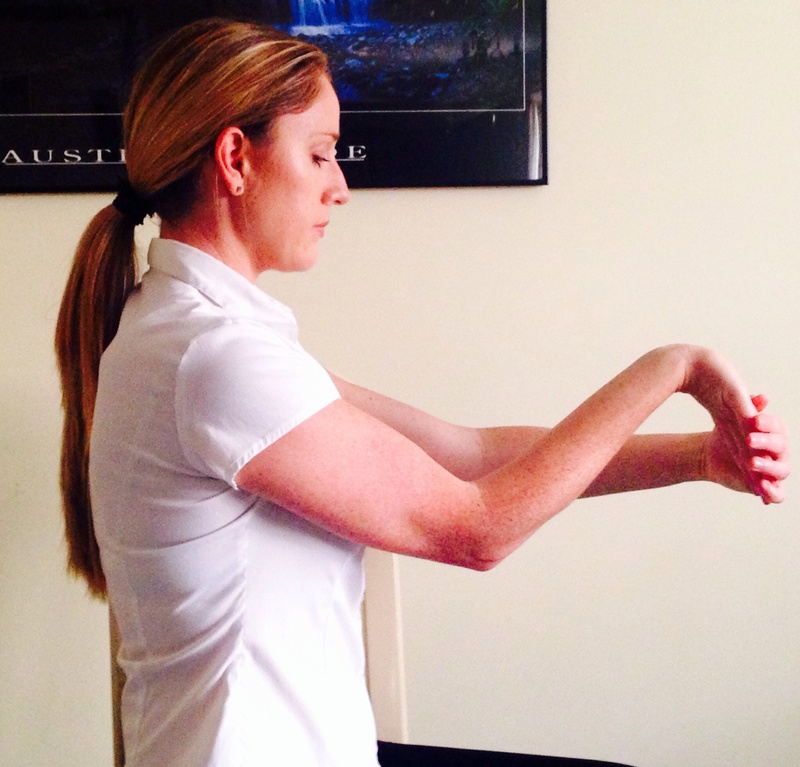 Keep the shoulders down, avoid lifting them to get into the position and while stretching. Gently pulling back on the fist to feel a nice comfortable stretch, the stretch may be around the wrist or further up the arm. You may only require a small movement to feel the stretch, without pulling the back very far on the fist. 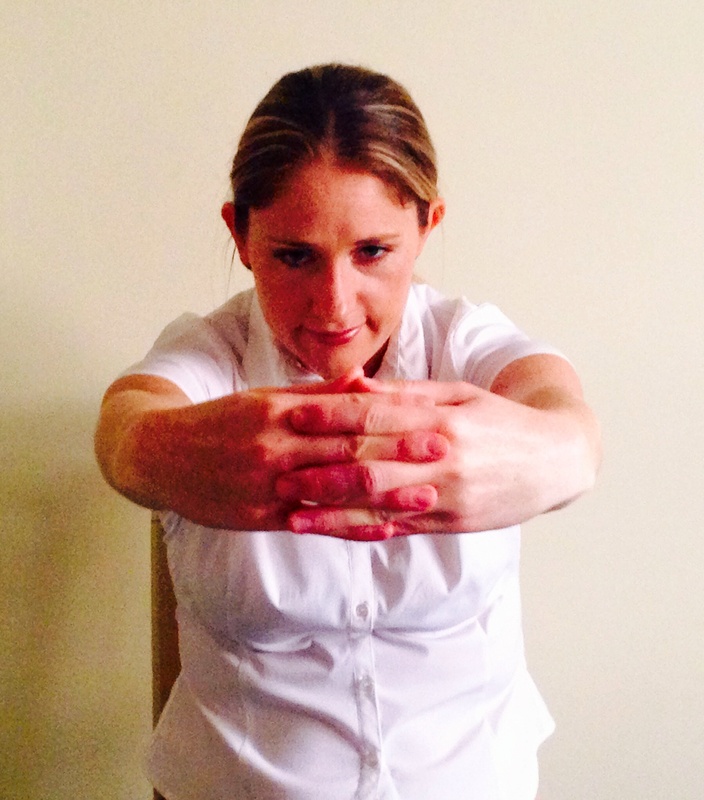 Hold the fist and gently pull back until a comfortable stretch is achieved.